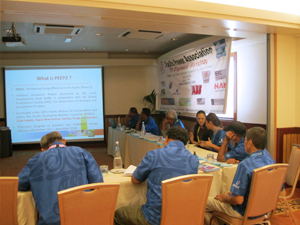 IIEC was invited to present lessons learnt to date in implementing the Asian Development Bank’s (ADB) Promoting Energy Efficiency in the Pacific - Phase 2 (PEEP2) Project at the Pacific Power Association (PPA) 23rd Annual Conference and Engineer’s Workshop on 8th July 2014 in Papeete, French Polynesia. The aim of PEEP2 is to improve efficiency in the use of electrical power for consumers in the Cook Islands, Papua New Guinea (PNG), Samoa, Tonga, and Vanuatu - through demand-side energy efficiency improvements in the residential, commercial, and government sectors of each country. The full day workshop, organized by the IIEC with support from the PPA included an overview and status of PEEP2, the benefits of energy efficiency in the Pacific Islands, energy efficient lighting programs, the Fridge-Freezer Replacement Program in the Cook Islands, field testing of AC technologies and energy efficiency in the hotels sector. 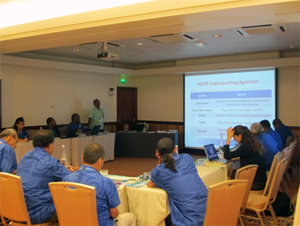 The workshop was mainly attended by electric utility representatives and engineers from several Pacific Island Countries (PICs). For further information on PEEP2, visit www.ee-pacific.net.